Best to have all ingredients at room temperature before starting. Melt the butter and let cool. Mix the eggs well with sugar whisking 2-3 minutes. Add the melted butter and the yoghurt to the egg mix. In another bowl mix the flour with the baking powder. Cut the vanilla pod lengthwise and scrab out the seeds. Mix the sticky vanilla with 1 teaspoon sugar to loosen the seeds for better mixing. Add to the flour. Mix the flour with the eggs very carefully without whisking too much. Only enough to mix the two together. Place the paper muffin forms into the pan and fill each half way. Leave some dough. Put about a teaspoonful of strawberry cuts on the dough and fill the forms with the rest of the dough. Bake the muffins at 200C for 18-20 minutes until light brown. You can check the readiness by lightly pressing on a muffin. When it raises back up they are ready. 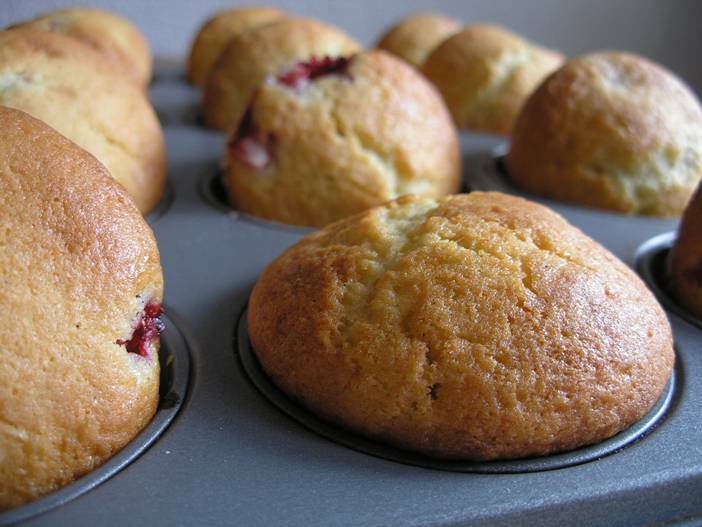 To cool the muffins and avoid them „sweating“ in the forms, place the muffins on the side to let out the steam. A fresh cup of coffee or tea or a glass of cold milk goes nicely with the muffins.